Good morning! I hope everyone is having a good week so far! Today’s card is my Design Team card for Cricut Cardz Challenge #46. This weeks challenge is “Anything Goes”. So you can use any cartridges, colors and theme you’d like! Couldn’t be easier to play along. And I hope you do!! I have enjoyed seeing all your beautiful and creative cards. Also I would like to say thank you so much for all your kind and sweet comments. I really do appreciate each one and they totally make me smile! So with that said, here’s my card. 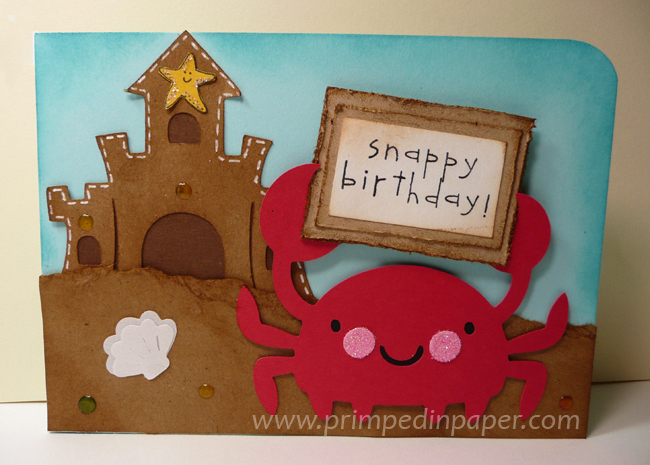 I used the Create A Critter cartridge, sentiment and starfish is from Stampin’ Up, Crab and Company (retired set). After I took pictures I decided to add some white stitching around the sandcastle door. To see a video of me explaining how I made this card in detail click here to be taken to my youtube video. That little crab is killing me with his cuteness! I hope you love it as much as I do. Be sure to stop by Cricut Cardz Challenge and play along this week. You may be the lucky winner and be entered into the grand prize drawing for October!!! Have a wonderful day. Hugs! I also entered this card into My Pink Stamper‘s “Make Something Cute” challenge! 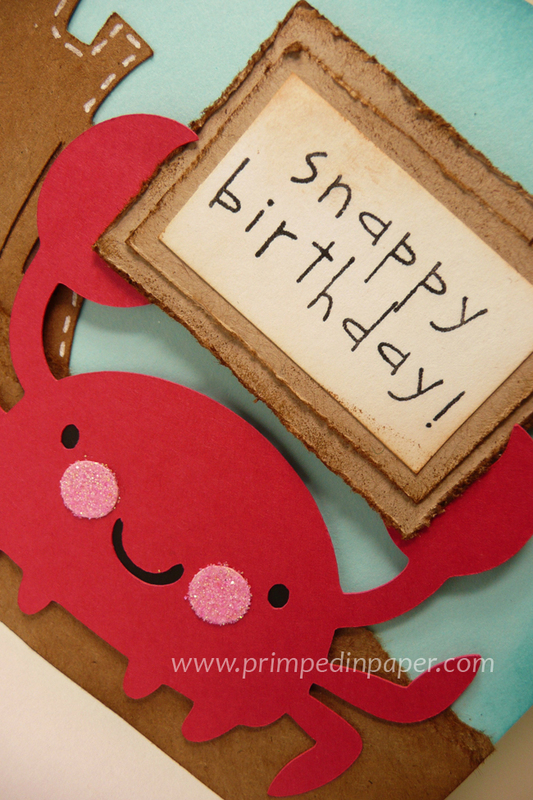 Snappy Birthday to all the October babies! 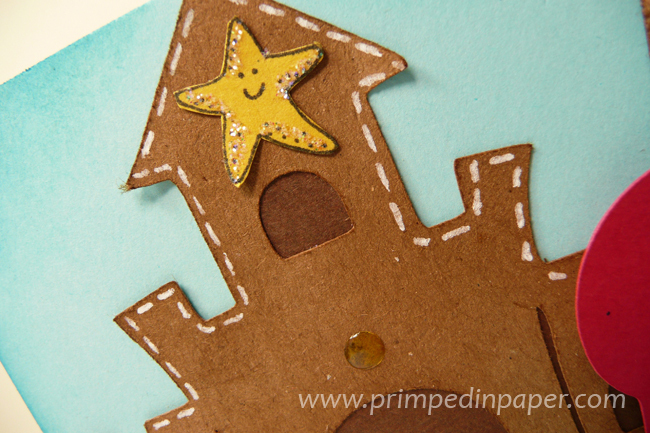 A little glitter on the starfish makes him super happy! I made the gems with crystal effects and copic markers! They are so pretty and easy to make. 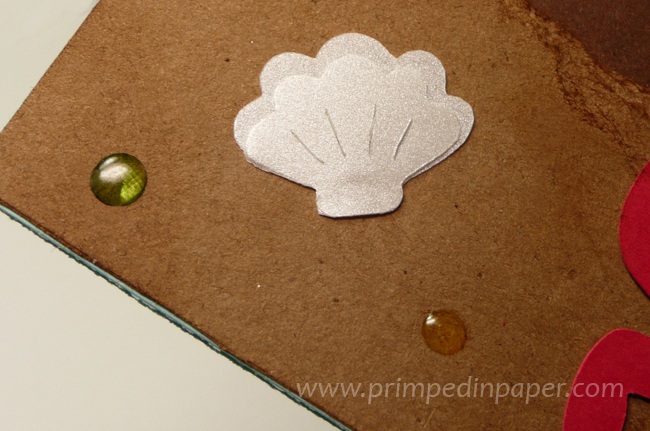 The shell is cut from iridescent vellum paper.